I am really into this spending money on myself. Well, not really. I had perfume from possibly seven years ago. I have just started really using it more. That is until my daughter sprayed half my bottle into my bathroom and it stunk for a week. Simply, I needed to buy more perfume. Seeing as I had a bonus coupon for 4000 Shoppers Optimum points for spending so much dollars or more on any fragrance, getting a perfume from Shopper's Drug Mart was a no-brainer. Plus it's just down the street from my home. BONUS! The girl was amazingly helpful. I was amazingly picky. Some perfumes smelled just narsty with their offensive violating my nostril smells. (The best sellers yet too) Were you aware that Justin Beiber has a fragrance? Me neither. I am really thankful that I don't like the smell. I am trying really hard to continue to not like him. This made it easier. The bottle was pretty though. Whoever had the idea for the packaging was smart. Some bottles smelled strongly like DEET. Mmmm...bug spray...yum. Others I strictly smelled the alcohol content in the bottle. Not sure about you, but I like to drink my alcohol, not smell like I bathed in it. Although, if Vodka was a scent. Nevermind, I digress. There was one scent that brought me back though. So for today's post I went searching through Google images to find it to post. That brought me to another perfume I tried out. Ah high school memories. Do you remember this scent? Exclamation! by Coty. I think every girl in my school wore it and I remember seeing the ads in Seventeen Magazine. I loved them. I thought they were fresh, and sophisticated. The ads themselves made me feel older. I had all but forgot about this little number until I came across a similar smell yesterday at the cosmetics counter. I felt young, fresh, and happy. All the good parts of high school came back to me. Hanging out with my friend Mel. Doing pretend fashion photo shoots. (She'll remember those. I promised I'd never show anyone, sorry readers. Maybe one day I'll put mine up.) Staying in and painting our nails. She was better at it than I. Heading all the way to St. Vital on the bus. Not sure what we were thinking and hitching a ride back in a car full of "cute" guys. Yeah, the good old days when we were invincible. Then there was another scent. It was nice, subtle. It was a pink bottle and that is all I remember of it. 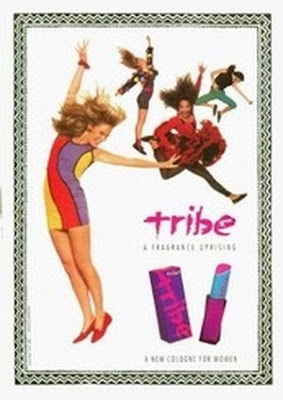 Because when it came down to it, all I could smell was "Tribe" and the memories kept skipping to the forefront of memory lane. So what did I end up buying that was so similar? I will note I was extremely disappointed by the packaging. Sure it could possibly ring true to the brand of Versace (Really I wouldn't know. I'm not "up" on all things fashionista), but it wasn't the type of packaging that would bring that kind of smell to mind. It's rather bland for the type of youth and excitment the scent brings me. The $62 price tag just about made me crap my pants though. Hubby said it was a decent price and for that name alone the price is typically $150. I also found out that perfume goes bad. Having a life span of about five years. It was my husband that told me that. I still don't know why he knew that and I didn't. Still looking for that bottle of Tribe, even if just for the bottle. Until then, Versace Versus will do. Except for the packaging. I swore I would find a way to pretty up that bottle before I allowed it to take up residence on my dresser. Two years ago, I asked my wife what she wanted for Xmas. Perfume. And lots of it, she told me. So for Christmas, I bought her a perfume for each day of the week,...yes, seven different perfumes, all hand picked by me! I quite enjoyed doing it too, I might add.